This recipe has evolved over the years, to what it is today; one of our (my) favorite side dishes. It's just your basic mac and cheese with a few small tweaks. I've tried it with almost every kind of cheese you can think of and I still like good old American cheese the best. Saute the finely minced onions until they are tender and sweet, set aside. Boil the pasta and vegetables (together) in the chicken broth until tender, then drain and stir a little butter into the pasta-veggies and set aside. In a sauce pan, melt 3 tablespoons of butter then stir in 3 tablespoons of flour, parsley, pepper and dry mustard. Stir and cook very slowly (let it just bubble) for about a minute, then add the milk, sauteed onions and bacon (whisk like crazy when you first start to add the milk to avoid any lumps). Stir and cook this sauce until it thickens. Remove from heat and add the cheese. After it sits for a few minutes, stir and the cheese should be mostly melted. Pour over the pasta and veggies and mix well. Pour into a greased 9 x 13 baking dish and top with bread crumbs (see note). Bake at 350 for about 20 minutes or until bubbly. NOTE: Place 2 cups of plain dry bread crumbs in a frying pan and add 2 tablespoons of butter. Toast over medium high heat (stirring) until bread crumbs have absorbed all of the butter and the crumbs are golden. Spread evenly over the macaroni and cheese before putting in oven. We've been hunting for a good macaroni and cheese recipe and with the bacon, this recipe sounds like what we have been looking for. Thanks. My goodness...that looks so delish! What a cool idea...penne is my favorite pasta to use so this looks right up my alley! That's so cool. what a neat gift. I've tried a few different version of homemade mac and cheese and I've used more quality (ie. more expensive) cheese and they're just not that great. I think American cheese is the trick because of it's meltability. What a clever and truly thoughtful gift, and it's so personalized! Love it! Mac'n cheese. Gosh, does this look good. And with bacon! YUM YUM I haven't made mac'n cheese in ages. Now I see all these creamy yummy goodness and I'm STARVING for it. Bacon! Wowza, that is an amazing mac and cheese and I wish I could eat it right now for breakfast!!! And that picture- WAY COOL! My goodness that certainly looks sinfully scrumptious!! Bacon cheese, veggies, wondderful one dish meal. My favorite kind. Oooh, I love the look of this. My kids love mac & cheese, but I can't stand the boxed stuff. This looks like a great compromise! That cube is so neat....Your mac and cheese looks delicious! I adore that loverly gooey-rich photo, Coleen! 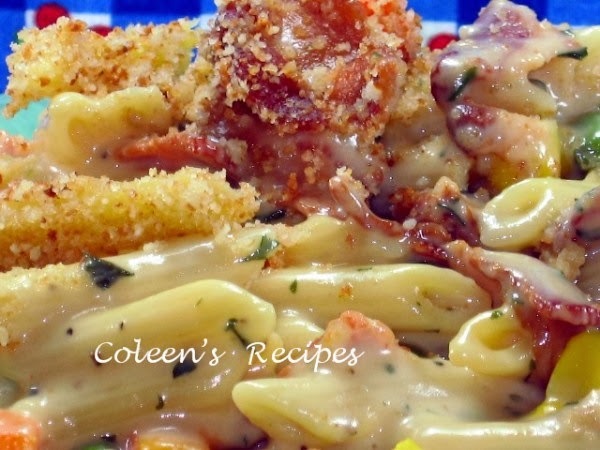 Mac and cheese is a family favorite- now I can add another of our loves- bacon! The photo cube is really a cute idea! Wow! I'm not a big mac n cheese fan, but this looks really fabulous! So creamy and luscious! I like how you pan browned and buttered your bread crumbs. That is a cool gift from Anncoo! what a cute cube, how sweet! the mac looks mouthwatering, i love it! oh dear, that looks so superbly scrumptious! TY! This really looks sinfully good. I know from experience that vegetables cancel out bacon, so by my rules this is not only delicious, it's also good for you :-). It really is a lovely recipe. Your macaroni looks wonderful! I love the addition of bacon. Mmmmm! That's a meal in it self Coleen! It looks fantastic! Looks like a wonderful and comforting dish! I am just trying to get up the energy to make dinner now.. I want to eat mac and cheese instead! Looks very comforting. meal. 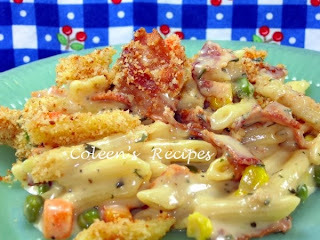 I love bacon, mac 'n cheese, and the vegetables in this dish sure is an added plus. Coleen, I enjoy viewing your blog and all the wonderful recipes you have posted here, and in case you haven't seen it, I gave you the Loveliest Blog Award at: http://domesticgoddessinthekitchen.